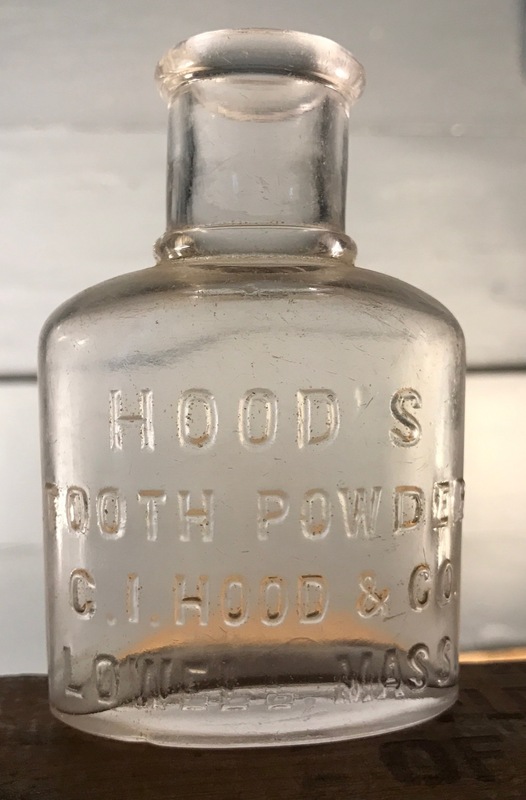 Hood’s Tooth Powder, C.I. Hood & Co., Lowell, Mass. C.I. stands for Charles Ira Hood. C.I. Hood & Co., whose signature product was Hood’s Sarsaparilla, was in business from the early 1870’s through 1922. Hood’s story, as well as the early history of the company, was told in “America’s Successful Men of Affairs: The United States at Large by Henry Hall, New York Tribune, 1896. Charles Ira Hood, manufacturer, Lowell, Mass., born December 11, 1845, in Chelsea Vt., is the son of Amos R Hood, druggist, and of Abigail Cilley Hood, his wife. The family belongs to English stock. The future manager of Lowell, unaware that the future was destined to make his name known to several hundred million human beings, went quietly to school in boyhood and after leaving the academy in Chelsea Vt., began at the age of fourteen to learn the apothecary business with Dr. Samuel Kidder of Lowell. For five years also, he served with Theodore Metcalf & Co. in Boston. When ready to act on his own account, he opened a drug store in Lowell Mass., and, in 1875, began the preparation of Hood’s Sarsaparilla and other ready made medicines. Mr. Hood was by no means a pioneer in this useful and lucrative business, but he had the good fortune to invent several preparations of great utility, and to possess the ability to advertise successfully not only his sarsaparilla, but the pills powders and ointments which followed. 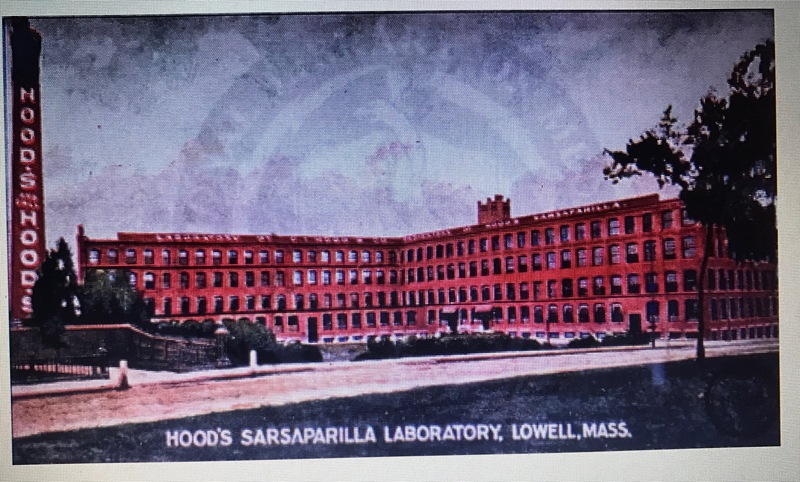 The result has been that the business has continually increased, until, today, Hood’s Sarsaparilla Laboratory, built in 1883, is one of the largest in the world, being five stories high, over 400 feet long, and having an average width of sixty-five feet. Mr. Hood is yet in the full tide of management. In November 1877, he married Miss Sarah Adelaide, a daughter of H.H. Wilder. The biography stated that the building wasn’t built until 1883, but it’s possible that the business was able to move there while the building was being built, either in a section of the building completed early or in an older building on the site that was later demolished. The company remained in business at that location until Hood’s death in 1922. An issue of the “Drug and Chemical Markets’ that year described the end of the business. The C.I. Hood Company, Lowell, Mass., manufacturers of family remedies, has been purchased for $450,000 cash by William R. Warner & Co., manufacturing chemists, New York and St. Louis. A large part of the business handled by the Hood Co., will be conducted through St. Louis. The Warner Co., recently purchased the Sanitol Chemical Co for $425,000. Through the purchase of the Hood Co., the St. Louis concern also acquired C.I. Hood & Co., Ltd., London, which handled the European business of the Lowell firm. The property was bought from Mrs. Sarah Adelaide Hood, widow of the founder of the company. Hood organized the company in 1875. The company was the greatest advertiser of family medicines in the world at one time. As far back as 1893 the firm’s advertising bill amounted to a million dollars for the year and total advertising expenditures amounted to twenty million dollars. In addition to their signature product, Hood’s Sarsaparilla, the company produced Hood’s Tooth Powder as well as a number of other proprietary products. An advertisement in the 1910 Lowell City Directory listed Hood’s Pills, Hood’s Olive Ointment, Hood’s Medicated Soap, Pepitron Pills, Antiseplets, Dyspeplets and Hood’s Plasters. I couldn’t find a directory listing for C. I. Hood & Co. in New York, but their products were being sold there. Hood’s Tooth Powder was included in store advertisements for Wechsler & McNulty, Riker Drug Stores and Abraham & Strauss. The advertisements were printed in the Brooklyn Daily Eagle between 1893 and 1917. 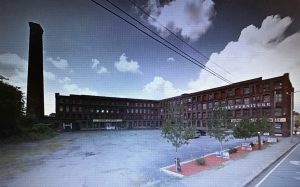 According to Google Earth, the Hood building on Thorndike was still there as late as 2012. It looks much like it did back in the day. And believe it or not, the building that housed the jail referred to in the Lowell directories is still next door. It’s now condominiums. The bottle I found is mouth blown and about 3 1/2 inches high. It probably dates to the early 1900’s from the Thorndike Street location.